A. Valley Entrance: The desert goblins maintain a watch post at the entrance to the East Valley. The guard typically includes several sbekki servants, one or two guard drakes, and at least one desert goblin archer. B. Rameses Plaza: Guards are stationed here to keep watch over the tomb where Denia is working (area 2) as well as back up the guards at A. This is a more significant presence than the post at A.
C. Central Plaza: A significant population of desert goblins, sbekki servants, other slaves, and monstrous allies is here at all times. D. Southwest Wadi: The desert goblins keep watch at the south end of the valley as well, protecting against any intrusion by the undead from area 12. 1. Tomb of Rameses VII (KV 1): Fully excavated by the desert goblins, the treasures of this tomb have been looted and its walls vandalized. The sarcophagus is blasted apart as if by an explosion from inside, and there is no sign of the mummy. Denia performed her first attempt at using the Scrolls of Thoth to animate the mummy and failed utterly, destroying the mummy in the process. The goblins avoid the site now, and it is usually deserted. 2. Tomb of Rameses IV (KV 2): Also fully excavated by the goblins, looted, and vandalized. Denia is in the process of preparing the burial chamber for her next attempt at animating the mummy, and the burial chamber is free of graffiti or other vandalism. Some desert goblins are stationed here to protect the site. 3. Tomb of the Sons of Rameses III (KV 3): Not yet excavated, but the site is identified. 4. Tomb of Rameses XI (KV 4): The goblins have begun excavation of this site. Slaves and their goblin overseers are here much of the time, and the Roman supervisor visits regularly. 5. Tomb of the Sons of Rameses II (KV 5): The desert goblins excavated the first few chambers of this tomb and abandoned it, unable to locate any royal corpses or treasures appropriate for their use. Marcus Viriens is interested in exploring the tomb further, however, and is often found here taking notes about the structure of the place. 6. Tomb of Rameses IX (KV 6): Fully excavated and looted, but the burial chamber remains untouched, awaiting Denia's attention. 7. Tomb of Rameses II (KV 7): Fully excavated and looted, this tomb serves as a living quarters for Denia and a few of her monstrous guardians. 8. Tomb of Merenptah (KV 8): The goblins have opened and excavated down as far as chamber F, but have not yet reached the burial chamber. 9. Tomb of Rameses V and Rameses VI (KV 9): This tomb is open and excavated, and was fully looted even before the desert goblins arrived on the scene. 10. Tomb of Amenmenses (KV 10): The entrance to this tomb is open, but the goblins have not begun extensive work here yet. 11. Tomb of Rameses III (KV 11): The entrance to this tomb is open, but the goblins have not begun extensive work here yet. 12. The Southwest Wadi: The tombs of the southwest wadi (13, 14, 15, 38, 47) were the site of a more ancient necromantic experiment that resulted in the creation of several mummies who now lord it over that part of the valley while engaging in petty rivalries among themselves. The desert goblins are terrified of these mummies and keep guards posted at the entrance to the wadi, but the mummies are waiting to see whether Denia has any success in awakening any of their peers. Mummies inhabit these tombs, along with other undead servitors: Tomb of Bay (KV13), Tomb of Tausert and Setnakht (KV 14), Tomb of Sety II (KV 15), Tomb of Thutmes I (KV 38), Tomb of Siptah (KV 47). 13. 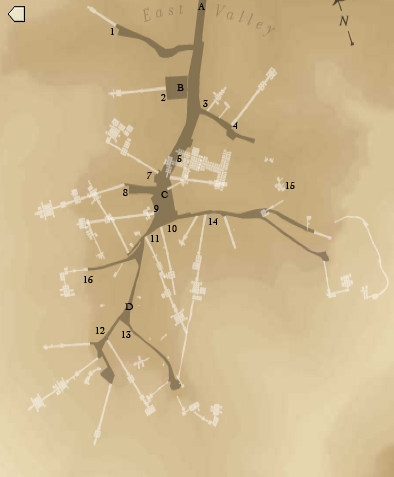 South Branch: The desert goblins avoid the entire southwest wadi, even though the south branch was not affected by the necromantic incident. These tombs are undiscovered: KV 29, 30, 31, 32 (Tia'a), 33, 34 (Thutmes III), 37, 40, 42 (Hatshepsut-Meryet-Ra), 59, F.
14. Tomb of Sety I (KV 17): The long tunnel at the back of this tomb provided the route for the desert goblins to reach the surface from their Underdark home. The tomb is fully excavated and plundered, and the mummy of Sety I has been destroyed just like that of Rameses VII (see 1). Desert goblins guard the entrance to their home at all times. 15. Ant Nest: These tombs (KV 27 and 28) were discovered by accident, and found to be crawling with giant ants. The desert goblins avoid them. 16. Tomb of Amenhetep II (KV 35): The goblins have opened and excavated down as far as chamber C, but have not yet reached the burial chamber.